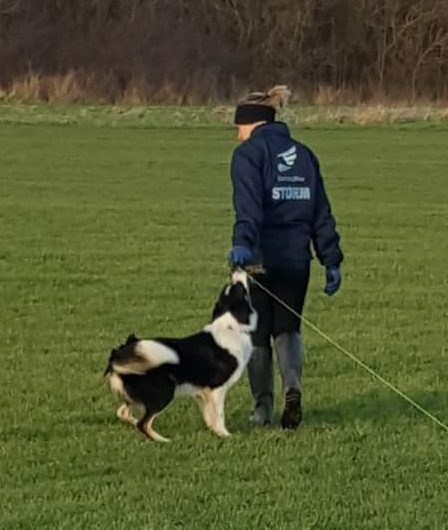 I first came across STORM Canis on the Racing Blue exhibition stand at the August British Flyball championships in 2014. I chatted to Racing Blue on their stand about the product and subsequently bought some to try and have supplemented my racing dogs with STORM Canis ever since. I compete with my dogs in flyball and I demand a lot from them, but equally I put a lot in to maintain their fitness. I figure out what is the best nutrition to give them and what they need and my dogs probably have a better more healthy diet than me! Their training and competition at flyball is only a part of their athletic lifestyle. My daily/weekly routine involves hydrotherapy, bike rides, lead walks, flirt pole, balance work, hill hikes, beach sprints, agility lessons and homework as well as newly discovered lure coursing. I try my best to promote my dogs wellbeing and fitness and work closely on a regular basis with a canine physio to keep them in good condition and use a porta mag to also help. After all of this input, both physical and nutritional, it was obvious to me that if I could find a product to help with recovery then it would be worth a try. STORM Canis was that product and has now been part of our athletic lifestyle for years. I know my dogs run well on this product and I can see it aids recovery by the consistent times throughout the days racing. Troos runs as start dog in out top team. He runs all day and sometimes has to run more than other dogs in the team due to the rules. Averaging 2 competitions a month I demand a lot from him! Troos gives me everything he has to offer and STORM Canis helps with that. He is 5 years old and loves to work. Competitions are just a piece to our fitness puzzle and is the reason we do so much to enable his body to cope with the demands. STORM Canis aids recovery especially for our demanding days.